NFF President Amaju Pinnick on Monday inaugurated the committee that will organize the first edition of the AITEO Cup Competition (formerly Federation Cup) for men and women. While inaugurating the 11-member Committee, headed by NFF 1st Vice President/Chairman of Organising Committee, Barr. Seyi Akinwunmi, Pinnick insisted that the Committee’s membership was strategically drawn based on the core services of the two competitions. NFF 2nd VP/LMC chairman Shehu Dikko is vice chairman, with NFF Executive Committee members Ibrahim Musa Gusau, Suleiman Yahaya-Kwande, Ahmed Yusuf Fresh, Sharif Rabiu Inuwa and Ms Aisha Falode as members. NFF General Secretary, Dr. Mohammed Sanusi is the Secretary. Other members are Mr. Andrew Onyearu (Group Executive Director/Chief Legal Counsel of AITEO), Mr. Ndiana-Abasi Matthew (Senior Manager, Corporate Communications of AITEO) and Barr. A. U. Mustapha (SAN). The NFF President charged the Committee to be fully focused on delivering a competition that the Nigerian Football fraternity and sponsors AITEO would be proud of. Responding, Barr. Akinwunmi promised that his team would move swiftly to draw up a revised calendar for this year’s competition, and also insist on the very best values in all areas of the organization while working to bring new glory to the oldest football competition in Nigeria. President of the Nigeria Football Federation, Mr. Amaju Melvin Pinnick has again re-affirmed total commitment of the present NFF administration to the improvement of refereeing in Nigeria. The NFF supremo, who is also Member of the CAF Executive Committee and Member of the Organising Committee for FIFA Competitions, restated his administration’s resolve to tackling one of the big issues of Nigerian Football at the opening ceremony of this year’s FIFA Member Association (MA) Elite Programme for Nigerian referees, assessors and physical fitness trainers in Abuja on Monday. “Refereeing is a critical aspect of the game of football. In fact, it is a major issue in the game. You would recall that at the advent of our administration, referees were the first set of people we sent on capacity building programme. Since then, our determination to improve refereeing in Nigerian Football has never waned, and going forward, we are fully committed to ensuring that we achieve wholesale improvement in all aspects of officiating. Also present at the opening ceremony, inside the Kalem Suites, Abuja were NFF vice presidents Seyi Akinwunmi and Shehu Dikko, Executive Committee members Ahmed Yusuf Fresh (Chairman, NFF Referees Committee), Sharif Rabiu Inuwa (vice chairman, Referees Committee), Ibrahim Musa Gusau, Suleiman Yahaya Kwande, Aisha Falode, Mohammed Alkali and Babagana Kalli, NFF General Secretary Mohammed Sanusi, NFF Director of Technical Bitrus Bewarang, NRA President Tade Azeez, former NRA President Ahmed Maude, other members of the NFF Referees Committee and some members of the NFF Congress. Despite Abia Warriors 1-2 loss to hosts, Gombe United in a Nigeria Professional Football League encounter last Wednesday, Chief Coach of the Umuahia based side, Abdullahi Biffo has doffed his hat for the referees who handled the match for a job well done. Speaking to sports writers shortly after the hotly – contested encounter at the Pantami Stadium, Biffo said the officials comprising Imam Malik Umar, Idris Nuhu, Abubakar Safiayanu and Shehu Saidu all from the Kano State Referees Council were fair, firm and in full control throughout the match. “The officials were simply fantastic and had the game under control” Biffo said insisting that his team’s defeat had nothing to do with bad officiating but rather a result of loss of concentration and a bit of hard luck. “I can’t still believe that we lost this match. We were fully in control and even held unto our lead until late in the game but things suddenly fell apart. Well, that’s football for you. We will now go back and correct the mistakes to avoid a repeat in our future games ” the former Niger Tornadoes gaffer said. During the match, Afolabi Abdulwaheed and substitute, Sani Mohammed Abbani scored in the 79th and 85th minutes to overturn what looked like a helpless situation for the under pressure home team after Yakub Hammed had given the Warriors the lead in the 62nd minute following a good build-up that also involved Sunday Adetunji, Sherif Bashir and Shedrack Asiegbu. Ex Shooting Star midfielder and now Sunshine Stars gaffer, Duke Udi lashes out at referees following his team’s loss to MFM on Wednesday. The Olukoya Boys handed a narrow defeat to the Owena Whales, but the newly installed manager was not impressed by the performance of the men in black. The Olukoya Boys completed a double over the Akure outfit after recording a 2-1 win at the Agege Stadium in the Nigeria Professional Football League Week 26 encounter. The former Osun United coach – angered by the display of the arbiters – threatened to follow in the footstep of his predecessor Austin Eguavoen after repeatedly questioning the officiating. “I beg to be corrected if this is the way football is been played; if this is the way referees officiate then someone like me should just resign,” Udi said. “Officiating should be 50-50, let our football grow. I don’t care if you are beating me at home, just let the better team win. It’s not fair when you favour a team against the other team. “When we were playing football, football was played with talent. Take for example the Premier League, teams go away to win but that won’t happen here. “If this is the way officiating looks like here then I should just resign. Can you imagine you do so much work for a week then someone will just thwart your effort and that of the players? It’s so unfortunate. Officiating should be free and fair,” he concluded. The Nigeria Football Federation alongside the League Management Company have consummated a multi-faceted strategic agreement in general football development with the Football Federation and Premier League body of the Kingdom of Morocco. On Thursday, NFF President Amaju Pinnick and NFF 2nd Vice President/LMC Chairman Shehu Dikko put pen to paper on a memorandum of understanding with their Moroccan counterparts, the result of detailed discussions, deliberations and considerations over time. The FA Presidents signed their own side in the offices of the Federation Royale Marocaine de Football in Rabat, while Dikko and and Chairman of the Ligue Nationale de Football Professionnel, Said Naciri signed at the LNFP office, watched by the two FA bosses. Both Pinnick and FRMF President Fouzi Lekjaa (who is also Director of Budget in the Kingdom of Morocco) are Members of the CAF Executive Committee. “The strategic partnership is for technical development, exchange of ideas and contacts, training support, friendly matches, use of facilities and joint marketing where necessary,” Dikko, who is also Chairman of NFF Marketing, Sponsorship and Television Advisory Committee and NFF Strategic Committee, explained to thenff.com. “Morocco has one of the best technical centres globally and they are still developing it, and they are delighted to make the facilities available for use by the National Teams of Nigeria and Nigerian Clubs. The Kingdom also has one of the most innovative structure in managing the domestic media rights of both their National Teams and the elite League, which we intend to replicate. On Friday, Pinnick and Dikko were at the offices of a Moroccan multinational company with extensive business interests in Nigeria, where an MOU was executed to explore the sponsorship of some activities in Nigerian Football including the NPFL. A steering group has been set up to ensure the conclusion and activation of the milestone MOU. The agreements represent another landmark feat by the Amaju Pinnick –led Nigeria Football Federation, coming exactly one month after the N2.5 Billion, 5-Year partnership with Nigeria’s foremost energy solutions company, Aiteo Group for payment of salaries of Coaches of the National Teams. The latest pact also sits comfortably with the ever –improving strong working relationship between the Governments of Nigeria and the Kingdom of Morocco. Only last week, both Governments signed pacts to drive the implementation of gas regional pipeline and fertilizer initiative. The proposed Morocco-Nigeria Gas Regional Pipeline will have a direct impact on 300 million people through the speeding up of electrification projects in West Africa. Rivers United FC is largely unheralded in African football but with Enugu Rangers, Wikki Tourists and FC Ifeanyiubah all failing to make progress beyond the early stages of the Caf Champions League and Confederation Cup this year, all eyes, in Nigeria will now literally be on the ‘Pride of Rivers’ to salvage some pride for the most populous black nation in the world. The Port Harcourt club originally claimed a ticket to represent Nigeria in the Caf Champions League and went about their business in brisk fashion, dispatching Malian side, AS Real Bamako 4-0 on aggregate in the preliminary round. A 3-0 success over Sudanese giants, Al-Merreikh in the first leg of their first round clash understandably set the pulses racing as expectation levels reached improbable heights with the belief that United could qualify for the money-spinning group stage at the very first time of asking. Implosion was to follow as the wheels came off spectacularly for the Nigerian debutants. The ‘Red Devils’ put the Nigerians in their place with a comprehensive 4-0 bashing at a rocking Al-Merreikh Stadium in Omdurman to send hearts sinking in unison. United had their tails firmly between their legs but reprieve was to come. Rivers United dropped to the continent’s second-tier competition following their failure in the elite tournament knowing fully well that no Nigerian club have ever claimed success in the CAF Confederation Cup. Their first test came in the shape of seven-time Rwanda National Football League champions, Rayon Sports in the playoff round. The Rwandese had the luxury of playing the second leg at the Amahoro Stadium, Kigali and many tipped them to progress at the expense of the Nigerian club particularly after their impressive display in Port Harcourt in the first leg. ‘Gikundiro’ with just one defeat in 22 domestic games, outplayed the ‘Pride of Rivers’ for large parts in the first leg decided at the Yakubu Gowon Stadium, Port Harcourt on April 16 with individuals like Nanei Thierry, Savio Nshuti, Djabel Nanishimwe, Eric Irambona, Moussa Camara and particularly Kwieera Pierrot impressing with slick displays. They were extremely unlucky not to score in Port Harcourt with United’s veteran goalkeeper, Sunday Rotimi playing an absolute blinder. A different proposition however awaited Rayon Sports in the return fixture in Kigali as United produced their most accomplished away performance of the season to grind out a 0-0 draw, sealing progress to the group stage on a 2-0 aggregate. The celebrations by the Nigerians at full time at the Amahoro were furious, especially as results from the domestic scene, where United was swimming in the relegation zone, were largely underwhelming. Things will however likely get tougher as matches in the group stages get underway this weekend. Rivers United have never taken part in the CAF Confederation Cup prior to 2017 and qualification for the group stage is pretty much uncharted territory for the Port Harcourt club. The Nigerians are in group A alongside FUS Rabat (Morocco), Club Africain (Tunisia) and KCCA (Uganda). FUS Rabat won the competition in 2010 and reached the semi-final in 2016. They were runners up in the CAF Super Cup in 2011 and current sit in seventh place in the Botola Pro (Moroccan top flight) a competition they have won on one previous occasion (2016) while finishing as runners up five times (1973, 1974, 1981, 2001 and 2002) in the past. Club Africain also have a storied history in African football. They were African champions in 1991 and runners up of the CAF Confederation Cup in 2011. The Tunisians also made their mark in the now rested Cup Winners Cup where they finished as runners up on two occasions (1990 and 1999). Many view the final side in the group KCCA as the weakest link in the section but the Ugandans have earned their stripes as one of the most formidable sides in East Africa. On Wednesday, KCCA emerged champions of Uganda for the 12th time following a 2-0 victory over Lweza FC at the Phillip Omondi Stadium. The Kasasasiro Boys (Garbage Collectors) have been competing in African club competition since 1977 and reached the quarter finals of the continent’s premiere club competition where they came unstuck against the powerful Asante Kotoko side in 1982 that whacked them 7-1 on aggregate. They have also reached the quarter finals of inter CAF club competition on three other occasions but never progressed past that stage. While all three clubs in Group A are dyed-in-the-wool campaigners in African club competition, Rivers United is making only its first expedition in such treacherous waters. Many members of the Rivers United team have since revealed that the highly charged atmosphere in Omdurman when they faced Al-Merreikh in Sudan contributed to their 0-4 capitulation to the Red Devils in the Champions League. The atmosphere in Tunisia on Sunday when United come up against Club Africain is likely to be similar, if not more intense. Club Africain play their home fixtures at the 60,000 capacity Stade Olympique de Radès which will literally exemplify a cauldron of hate and noise on Sunday evening. The Tunisians are a free-scoring side and they proved that point with distinction by putting six goals past Mauritian outfit, AS port-Louis 1000 in the playoff round. Top marksman, Saber Khalifa who scored in the playoff round against the Mauritians, is responsible for most of the side’s goals. The 30-year-old fox-in-the-box, is a full Tunisian international who has scored seven times in 41 appearances for his country’s senior national team, the Carthage Eagles. Algerian, Ibrahim Chenihi and Zimbabwean, Matthew Rusika are the two other main outlets for Club Africains’ goals. Club Africain is a well-oiled machine; a truly professionally-run side with eight non-Tunisians which includes three Europeans (a German and two French) on their books. Coached by one of the most progressive North African trainers around, Ellili Chibeb, the fluid-playing Club Africain represents one of the best sides on the continent. Chibeb, who has previously coached clubs like Monastir, Stade Gabésien, CA Bizertin and CS Sfaxien is an advocate of attacking football but he gets irked when his side concedes! In 23-year-old Ali Abdi, Ellili has a ‘general’, with experience that tends to belie his relatively tender years, on whom his defence is anchored. Only Esperance and Etiole du Sahel have performed better domestically than Club Africain this term and Rivers United will need to produce their best performance this season to have any chance of winning in Tunis on Sunday. Club captain, Festus Austine knows the task is daunting but believes it can be accomplished. “We are not going there (to Tunisia) to draw the game. We want to win,” he said to www.riversunitedfc.com.ng. “It will be difficult but we want to top the group and to do that, we have to get a good result in Tunisia. “We want to become the first Nigerian club to win the Caf Confederation Cup title and we know we can do it,” he concluded. Tough words but talk is cheap. Rivers United must be ready to walk the walk if they are to make history. Abia Warriors Football Club is very much determined to bounce back into reckoning in the Nigeria Football league. And to this effect the Umuahia based outfit has signed four players to ensure that this dream of theirs is attained. The players are Chinenye Agoha, Chima Ndukwu, James Nicholas and returnee, Binaebi Johnson. Johnson, who featured for Abia Warriors last season, had failed in his bid to seek for greener pastures and had to return to Umuahia to rejoin his colleagues. 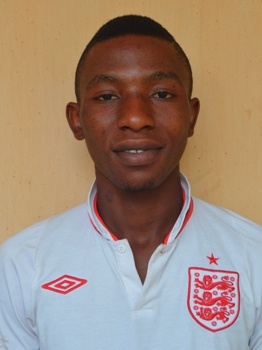 For Agoha, he was one of the players of Giwa Fc of Jos who were freed by the League Management Company to play for a club of their choice until the end of the season after the club was expelled from the league for failing to honour three games within the season. The Umuahia born striker, who once featured for Zoric FC of Brutan, says he is happy to be back home. Chima Ndukwu, a combatant midfielder joined Abia Warriors after his adventure with Jomo Cosmos of South Africa. The Owerri, Imo State born player had featured for JUTH of Jos before he travelled to South Africa. James Nicholas was discovered at the recently concluded Nigeria Police Games in Abuja where he emerged as the top scorer. The cross Riverian had previously played for Enugu Rangers International and Crime Bursters FC of Enugu before Abia Warriors grabbed him following his exploits in Abuja. In his reaction, Kennedy Boboye, the Manager of Abia Warriors expressed hope that the new additions will improve the team’s performance as they have been tested and found worthy, having all played the game at the highest level. 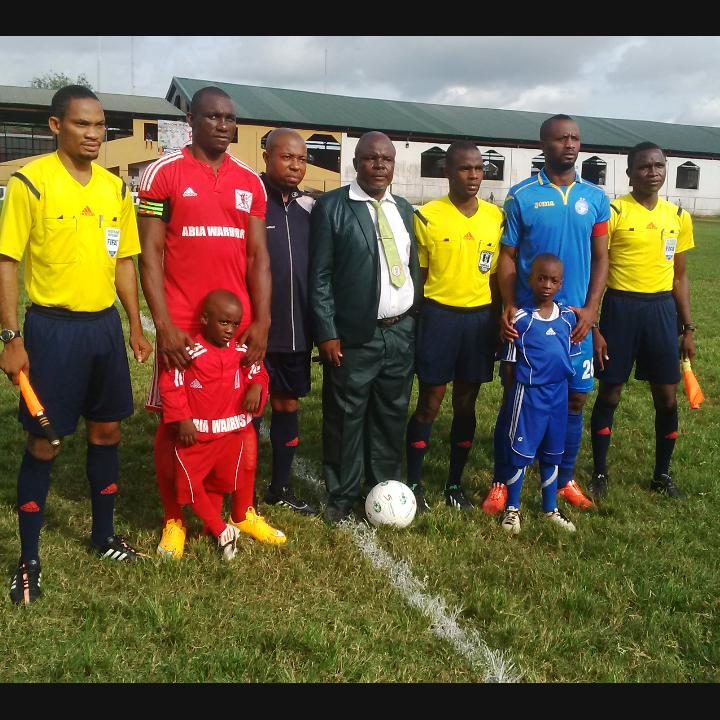 Abia Warriors FC of Umuahia made history on Sunday when they became the very first Nigerian club to use fully kitted child mascots in a league match. Before the Abia Classico between the Warriors and Enyimba, both teams filed out with each captain clutching the hands of a child mascot fully kitted in his club’s colours. According to High Chief Emeka Inyama Chairman of Abia Warriors this is one of many innovations the club has put in place to entertain her fans. “Football is entertainment and holistic football entertainment carries the fans along not just on the field of play but also off it. We make extra effort to provide adequate entertainment for our fans. We also strive to run our club with international best practices. We look at how fans are entertained abroad and we bring it to our games because we love our fans and we feel they deserve the best always. “Aside the child mascots, we make sure every single child that comes to the stadium on match day receives a family pack of snacks to entertain themselves with while the game is on. We also sharelight entertainment to adult fans, and conduct our usual raffle draws. I want to use this opportunity to thank Chief Obioma Okorie, Chairman of Obioma Cement Enterprises Ltd for sponsoring these events, including the man-of-the-Match award won by Anthony Okemmiri. “I promise our fans that next season will even be better for them as our team will be more competitive on the pitch and more entertaining off the pitch”, concluded the Amiable sports administrator. The Nigeria Football Federation has showered praises on the Ondo State Football Association for the inauguration, as well as the cardinal objectives behind the Ondo State League Management Company. At a formal presentation of the OLMC to the NFF in Abuja on Tuesday, NFF General Secretary, Dr. Mohammed Sanusi, extolled the vision and commitments of the OLMC, and showered encomiums on the Ondo FA for the initiative. “I must state that this is the first time that a State is taking this bold step, which is in tandem with the vision and mission of the present NFF administration. The present NFF administration has short –term, medium –term and long –term objectives, and sustained development of the game from the grassroots level is the long –term. “I am happy to see that you are working together with the Ondo FA, and also want to advise that you should work harmoniously with the Ondo State Referees Council, and to only make use of registered referees, while you also build a mechanism that will ensure continuity. Your efforts are both commendable and worthy of emulation,” Sanusi said. He also charged the new body to make transparency and accountability their watchwords. In presenting the OLMC, which he inaugurated in March this year, Chairman of the Ondo State FA and Member of the NFF Executive Committee, Otunba Sunday Dele-Ajayi, stated that the new body is committed to working assiduously to see Ondo State produces the most players in the various National Teams in the near future. OLMC Chairman, Prince Dapo Ajibade, explained that a total of 16 teams have already registered for the first season that starts in October, while the pre-season tournament that is currently on has presaged an excellent season. The OLMC is committed to providing 15 pairs of soccer boots per team, two sets of customized jerseys per team, 50 jerseys for referees and monthly allowance per team. The Ondo State Premier League matches will take place at the Akure Township Stadium, Ondo Township Stadium, Okitipupa Township Stadium, Owo Township Stadium and Ikare Township Stadium. Other members of the OLMC are Ibukun Faloye (vice chairman), Ade Gbangba, Fidelis Fabidun, Henry Babatunde, Daramola Ife, Tunde Igbasan, Michael Fabonmi, Sola Oke, Aderemi Adetula (secretary) and Timilehin Oni (administrative secretary).